As part of a recent assignment, I was asked to choose and write a few sentences about a gemstone that fluoresces (shines or glows brightly) under UV light. While some wonderful and unusual gemstones were chosen by my classmates – including Amber, Agate and Blue John – I decided to pick perhaps the most well-known of all: diamond. Because, well, I love diamonds! Before I mention the facts around diamond fluorescence, it’s useful to first explain what fluorescence is and how it occurs. Fluorescence (a type of luminescence) is the emission of visible light while a substance is being excited by light or electromagnetic radiation – either visible light, ultra-violet light or X-rays. This shorter wave, higher energy light/radiation sits further down the electromagnetic spectrum than the visible light being emitted, and is effectively ‘exciting’ the substance’s electrons so they move about. When the radiation source is removed, the glow stops. While in diamond mines X-ray is predominantly used to separate materials (because all diamonds fluoresce chalky blue under X-rays), it’s not really a practical method for those of us outside of a lucrative mine or a gem-testing laboratory. For us, long wave ultra-violet light (LWUV) or short wave ultra-violet light (SWUV) is the most convenient for testing purposes, with LWUV far safer and therefore more convenient to use. According to Peter G. Read in his book ‘Beginner’s Guide to Gemmology’, 10-15% of all diamonds fluoresce under UV light. The GIA on the other hand, cite that 25-35% of all diamonds that have been tested in their labs over the last decade have fluoresced to some degree, with 10% fluorescing enough to affect appearance. Peter G. Read notes that diamonds that fluoresce predominantly belong to the Cape series – Type Ia diamonds with nitrogen atoms as the main impurity. Diamonds can fluoresce yellow, orange, red, white and green, but blue is by far the most common colour. 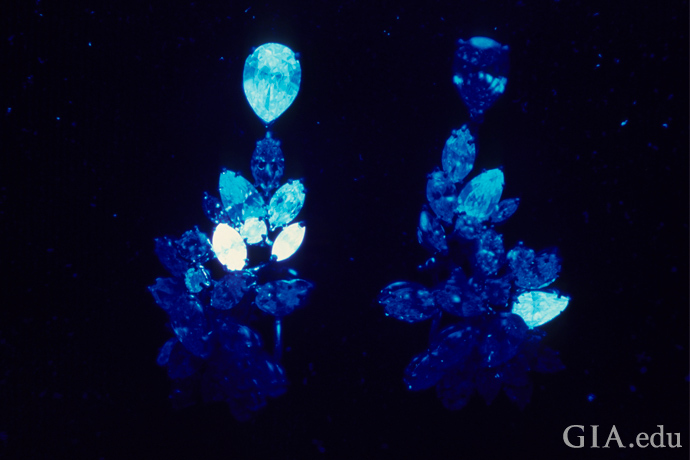 Approximately 95% of diamonds that fluoresce will do so in blue. If a diamond is going to fluoresce, the strongest reaction is likely to be seen under LWUV, with the result from SWUV generally weaker. So how does this help us identify diamonds? UV testing is useful when dealing with jewellery that features multiple colourless stones such as a necklace or line bracelet. In a multi-diamond piece, we would expect to see some inert diamonds that do not react at all to the UV light, some diamonds emitting a blue glow (of varying strengths) and possibly one or two stones displaying a different coloured glow. If every diamond fluoresced the same colour/strength, or none fluoresced at all, we would be highly suspicious that we were looking at a simulant such as cubic zirconia (yellow-orange), glass (inert), synthetic spinel (inert) or zircon (brownish-yellow). The result would not be diagnostic, but would alert us to the need for further testing. Fluorescence is not a diamond grading factor, but its affect on value differs depending on who you ask. Does it increase value, decrease value, or really make no difference at all? I will save that discussion for another post. Meanwhile, should you wish to check out diamond florescence yourself, LWUV keyring torches (365nm) are inexpensive and easy to use pieces of kit. Gem-a stock them for under a tenner.